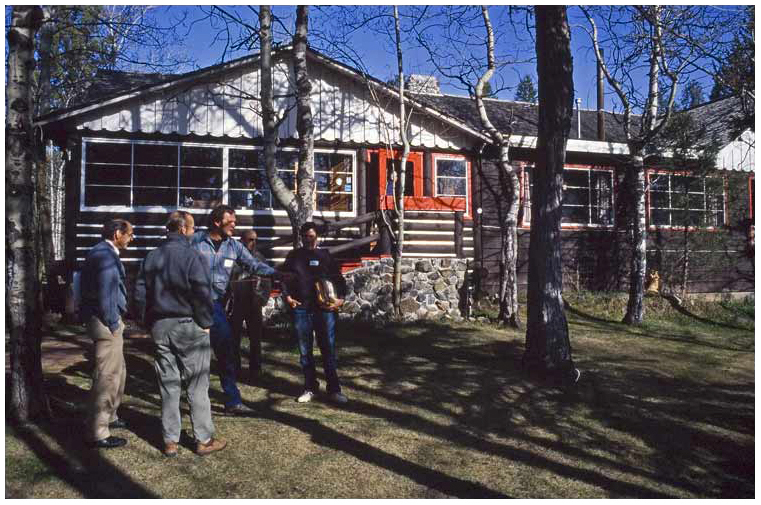 The 1992 bamboo rodbuilders workshop at Corbett Lake Country Inn took place on April 24 to 26. 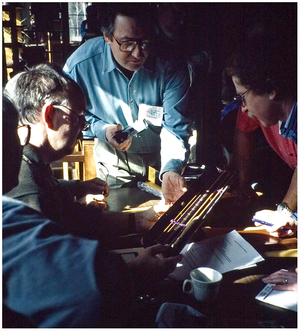 It has been the third meeting of this kind, with all in all, over 40 rodbuilders and bamboo enthusiasts from the Pacific west attending the meeting. There have been rodbuilders of all levels of expertise - from beginners to pros - but obviously there has been something to learn for everyone. On Friday afternoon the first attendees arrived and after putting the baggage into the room and after a brief registration, bamboo talk began. That was the time to renew friendships, or make new friends, sitting or standing in the dining hall of the inn, or at the bar enjoying a cold beer. This time of socializing perhaps is one of the most important aspects of the whole meeting. After dinner at 8:00pm socializing and bamboo talk continued until the attendees started to fall asleep -- Most of them had traveled a long way for that meeting: They came in from various parts of British Columbia, Alberta, Washington, Oregon, Montana, California, Idaho, Arizona, Alaska, New Jersey, and Germany. In the main room of the lodge, at "hard work"
The first presentation has held by Harold Demarest of Bloomingdale, NJ, about the history of bamboo growing and trade in China and the history of Charles H. Demarest, Inc. He presented historic material and photographs, one of them taken in the 1930's, showing himself together with the most important Chinese bamboo traders of that time, all of these Chinese gentlemen wearing these long traditional silk dresses. He outlined the differences in the bamboo trade of former times and the times after the communists had taken over business. In former times he was able to deal directly with a particular grower or trader, but now his company has to negotiate with committees that constantly change from day to day. After all it became clear why the quality of the bamboo poles has been better in former times, because at that time he was able to contact the trader in China and complain about the bamboo if the shipment has been of poor quality. So there was a way to control the quality by forcing the Chinese traders to ship good quality material or be out of business. Of course all that changed when the communists took over the country. Mr. Demarest also talked about the time when fibreglass entered the marketplace and almost ruined the bamboo trade within a short period of time. His company bought a lot of bamboo from commercial rodbuilders, that went bankrupt or had switched over to the new material. That way his company had huge stocks of bamboo and they did not run out of stock during the entire embargo time.